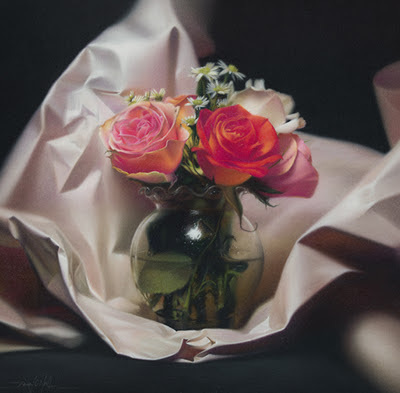 Bio: Brian O'Neill is a Signature Member of the Pastel Society of America whose work has been displayed in galleries across the United States, Canada, Japan and England. In the spring of 2009 Brian was accepted to begin an apprenticeship at the world renowned Waichulis Studio in Mountain Top, PA. The commitment to excellence practiced at the Waichulis Studio quickly proved to be a perfect fit for O'Neill's love of realism and representational art and an exciting addition to his continued journey toward artistic expression and growth. O'Neill has received many awards and honors for his work which include most notably, Blossom 2: Art of Flowers international juried competition Jurors Choice Award and Honorable Mention at The Naples Museum of Art in Naples, Florida. The Pastel Journal Top 100 Competition Second Place and Honorable Mention Awards, The Artists Magazine Annual Art Competition/and All Media Competition Honorable Mentions and Finalists Awards, and The Art Renewal Centers Annual Salon Competition Finalist Award. O’Neill has been exhibiting his work throughout the United States since 2003. Navigation: The links remain available on left of page. Gallery: Realism Dry Media; Realism Oil on Panel; Organic Abstraction; Contemporary (Acrylic) Floral. Image View: Click on thumbnails to enlarge in viewer. Safe on Arrival is 18 x 18 ins, 550 x 541, 185 KB. Looks so real and neat.